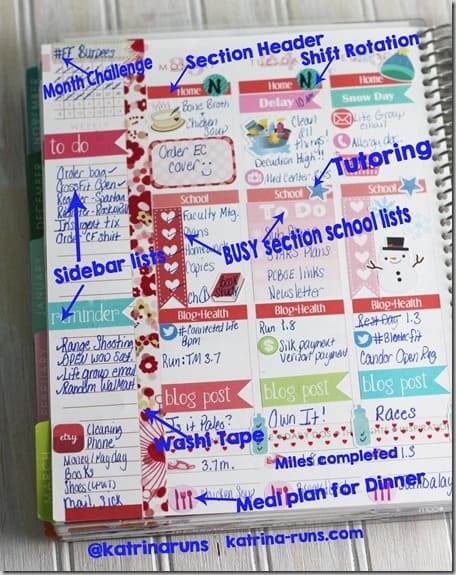 This week, I wanted to share a little more in-depth of how I go about setting up my Erin Condren planner each weekend. (Save $10 HERE) I get a few questions each week on IG about how I set up my planner and what information the stickers refer to. I decided to make this a Saturday feature. I also get a LOT of questions about which stickers I use and where I find them. My answer is ETSY! I want to feature a shop each weekend and show the stickers I love to use. Here is an example of last week. I will list my thoughts on all this madness. 1. The very first thing I do on a new week is add my section labels. The original EC is divided into sections “Morning Day Night”. That has never worked for me, so I print off my own section labels. I made a spreadsheet file and played with the dimensions until I got the exact measurements. I use a craft paper cutter to cut them into rows and stick them on the sections. My sections are “Home, School, Blog+Health”. 2. Next, I add washi tape to the side and bottom to add some color to the page. I have a very extensive washi collection that will last me a while. I only use it on the side and bottom. I have not been too creative in using it on the info entries. I love my stickers for those. 3. I add Stephen’s shift work circles. My meal planning is based on his rotating shift schedule. I use D for day shift, N for night shift. 4. Next, I add my “to do” stickers to my School section. It is a very busy section and each day, there is a list a mile long. I add the most-important stuff to my planner. I also teach in an after-school tutoring program called STARS. I use the star stickers in my schedule. 5. Dinner and Miles. I have several varieties of meal stickers and shoe stickers. I set up my bottom section for recording and planning both. 6. Sidebar stickers. This is a place where I quickly add in stuff to remember. As the week goes by, I’ll finalize when and where to do those tasks. After I have get those placed, I then use various icon stickers and blank flags, squares, and checklists to plan my week. Each night, I spend about 10 minutes planning the next day or further in the week. It has definitely helped me stay on top of blogging duties, school reminders, and daily quick household chores so I’m not spending a whole Saturday cleaning from top to bottom. A little work each night helps a LOT. And that’s about all I do each week. As I go along the week, I spend maybe 10 minutes a night review and adding to my planner. It goes where I go and I wouldn’t have it any other way. Would you mind sharing the file that you use for your section labels? 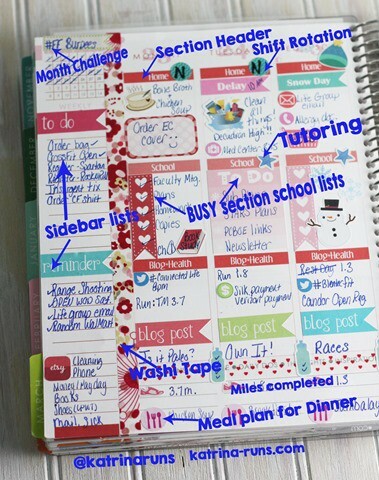 I would love to do something like that with my new planner.